Trekking starts from Lukla to Kalapatter having its great scenery and spectacular panoramic views of the Himalayas including Mt. Everest. Then you will continue to climb famous Island peak as well as to experience highlander Buddhist culture and the legends of Yeti. Trip end at Lukla and fly Kathmandu. 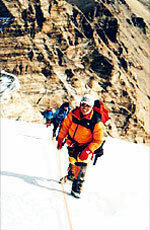 Trekking to Kalapattar top is considered as middle hard trek of Nepal. 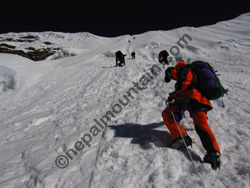 If you are moderately fit and have a sense of adventure you will finish your trip successfuly both trek and climb and enjoy a lot. 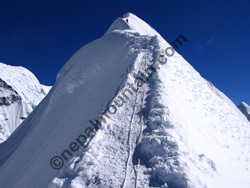 But climbing Island peak require additional experience of mountaineering skill. The program is designed to acclimatize you gradually and not to experience high altitude sickness. However you are requested to check your altitude fitness and the itinerary. 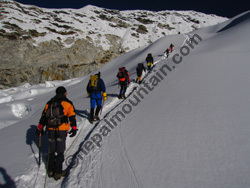 This trek is considered as a non-technical trek and suitable for average people. 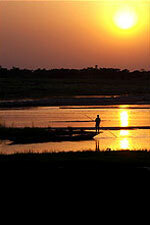 If you are moderately fit and have a sense of adventure will enjoy this trek. 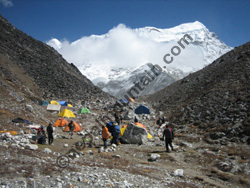 The program is designed to acclimatize you gradually and not expected high altitude sickness. However you are requested to check your altitude fitness and the itinerary. - Expenses of personal nature such as laundry, telephone calls, Soft drinks, alcoholic beverages, mineral water, tips etc.